Language: adjectives. E.g. persuasive, pushy. Language: vocabulary (animal noises, vocabulary from the audio) and infinitives of purpose (in order (not) to, so as (not) to) and the conjunctions so that and in order that. A free downloadable lesson, based on a clip from a science-based BBC programme about cats and their behaviour. This clip looks at how cats communicate with each other and with humans. Students start by looking at some of the ways that different languages describe the way that dogs speak, before looking at some common animal sounds in English. Students are then guided through the video, answering a variety of different question types, and learning some more vocabulary from the video. There is then a focus on infinitives of purpose, in order to as so as to, and the conjunctions so that and in order that. The lesson is about a new online service, CrowdWish, which invites people to post their wishes on their website. Every day people vote on the most popular wish, and CrowdWish will grant it! Students start by discussing some wishes taken from the site, then read a short text about what the site aims to do (so don’t tell them at the start of the lesson!) There is then a focus on some useful idioms, before going on to watch a video in which the founder of the site, ‘pitches’ his idea. The video is fairly complex, but students are simply asked to put the topics they hear in order. Students then look at the grammar used with ‘wish’, particularly at the use of ‘would’ when you want someone else to change their behaviour. Finally the students come up with their own wishes and vote on them, like on the site. You could even try and grant the top wish if you’re feeling creative..
A free downloadable lesson, based around a Russian advertising video for shampoo. Despite what is aims to sell, the video is actually quite inspiring, with the story of a girl who succeeds against the odds through pure grit and determination. Students start by watching the video and trying to guess what it is trying to advertise (so don’t tell them!). There are no words on the video, just images. They then try to reconstruct the story in pairs, watching the video again to check their ideas. The lesson then goes on to focus on a range of linkers used to give reasons or results, make contrasts and show when something happened. Students then work with some vocabulary to describe personality, and then put it all together by writing the story of the video, using the linkers and the vocabulary where appropriate. Finally, there are some quotes about success for them to discuss. The lesson starts with an activity to find out what students know about orangutans. It then moves onto the video, which claims to be a sign language conversation between a deaf American girl and an orangutan. In fact, the video is staged, but it will have more impact if you don’t tell students this at first. The video is subtitled and the language until the last section is very straightforward. Students then do a matching exercise on some vocabulary related to the video, before using the words to complete a short text explaining what is happening to orangutans as a result of the cultivation of unsustainable palm oil, and what we can do about it. The lesson ends by asking the students to consider some of the issues. The lesson starts with a short text to introduce the topic and get the students thinking about how people recognise and celebrate gratitude in their cultures. It then moves onto the video, where students watch two people visiting a friend and reading aloud a letter they have written , thanking them for what they have done. There is some focus on vocabulary, and some useful phrases that students could use themselves to say thank you. Finally, the students are asked to write their own thank you letter, which they may or may not choose to actually deliver. The lesson starts with some discussion about marriage before students are asked to give their ‘top tips’ for a successful marriage. They then watch the video and compare Selma and Kenny’s advice with their ideas. Click on the picture for the audio link. The lesson starts with a short text giving some background to the Depression of the 1930s, and invites students to think about parallels with the situation in some countries today and what can, or should be done by individuals and governments. Language: Present Perfect for experience (Have you ever + past participle) and idioms. The lesson starts with a quick review of present perfect for experience: Have you ever + past participle? The lesson is based around the recent Dove advertisement, showing the huge difference between women’s views of their looks and how other see them. The lesson starts by focusing on collocations to describe facial features, such as thick hair, full lips and so on. Students then watch the video and discuss some of the issues raised, including self -esteem, the role of the media,and differences between men and women. More language to describe physical appearance is ‘pulled out’ of the video, and the lesson ends with students writing detailed descriptions of themselves. An optional extra that might work well to lighten the class a little is a very funny spoof video, where some men find out that they are actually much uglier than they think they are! The link is in the accompanying notes. Joshua, who has Asperger’s Syndrome, interviews his mother, giving us insights into what it’s like for him to be different from others, and the loving relationship between the two of them. Great for raising awareness of Asperger’s and of bullying, and very touching. The lesson involves listening and inferring meaning, plenty of discussion, and also has a focus on ellipsis, where words are omitted because the meaning is clear. This lesson is about why smiling, even when we don’t feel much like it, can actually make us happier. The lesson starts with a short video, demonstrating the impact of smiling on the ‘miserable’ people of Edinburgh. After some brief discussion, the students go on to read a text about the various scientific findings about the emotional impact of smiling. The text and task (summary completion) would be suitable for students preparing for IELTS, especially at a lower level, but is suitable for a General English class as well. Finally, the lesson looks at a lexical set of idioms to describe emotions, and the students are asked to discuss how different situations might make them feel. The lesson is based around another wonderful animated true story from http://www.storycorps.com. The conversation between a mother and daughter looks back on the family’s struggles as poor immigrants to the US, and how the daughter was inspired by her mother’s determination. It would work very well with groups of students who have experienced something similar, but is suitable for anyone. The lead-in task asks students to predict, using pictures of key incidents in the story. The use of pictures makes it suitable for lower level learners, and it could also be done with learners who have literacy issues, by making the follow up questions oral. After watching and listening, students are asked to think about whether they admire the parents in the story (or not), which should lead to some interesting discussion about immigration, the necessity of working versus spending time with children and so on. Then there is a focus on impersonal pronouns/adverbs (something, anything, everyone.nowhere etc) and a discussion task which brings in more vocabulary to describe qualities we’d like to pass onto our children. Again, this could be adapted to lower and higher levels through the choice of vocabulary. After a video lead-in, the lesson is based around a video of British chef, Jamie Oliver, demonstrating exactly what does go into cheap chicken nuggets to a group of American children. It’s pretty revolting, but the children reckon it’s ‘awesome’..and there’s a surprise at the end. The lesson is at two levels, Lower Intermediate (A2+) and Upper Intermediate (B2+). The video is quite easy to follow even if students don’t understand everything that’s being said. Both versions introduce a set of vocabulary for talking about junk food, and both have a variety of discussion tasks and questions. The lower level version also introduces some functional language for giving opinions and agreeing and disagreeing, while the higher level version looks at how to use contrast markers, although, even though, despite etc. To R.P. Salazar, with love. Language: Different uses of ‘like’, including ‘slang’ uses and ‘would’ and ‘used’ to for past habits. The lesson uses an authentic recording from http://www.storycorps.com, which has also been animated. The lesson focuses on vocabulary and grammar from the recording, and asks students to think about the role of luck or fate in our lives, and whether there really is someone for everyone. The lesson finishes with a speaking activity where students can tell the tale of how they and their partner (or a couple they know) met. Language: Vocabulary from the text, related to money and to different roles. Note that the lead-in video is in German, and students should use the subtitles. After the lead-in, students work on vocabulary from the authentic text, related to money and different roles in life. They then look in detail at the reading text before being invited to consider their opinions about Heidemarie’s lifestyle, and the bigger question of whether society is too materialistic and whether (and how) it should change. Level: At three levels, see below. This lesson starts with a short reading text about a recent event at a coffee shop in Canada, where some-one’s kindness in paying for the person behind them led to 288 people passing on the favour to the next in line. The lesson then uses the video above (no words, just music) to extend the idea, before focusing on defining relative clauses. There are three different versions, so that you can either choose the most appropriate for your students, or use all three with mixed level classes. The lesson rounds off by asking students to complete a story, imagining their own chain of events. Pingback: Recap of Resources and Interesting Blog Posts – 18 February 2013 | Stop Complaining – Enjoy Teaching! Thank you so very much for such a great material. thanks, these lesson plans look good. Thank you so much for these time-saving materials and for the genre-based writing information. These materials and ideas are just my style and yet I love that I don’t have to create them from scratch (which I like to do but takes me a long time)! Some of the lessons do not contain a handout attached. Is that intentional? I’ll definitely be checking in regularly. Please keep it up!!! Thanks very much! No, it definitely isn’t intentional, so could you let me know which ones, and if they’re on the downloadables page or posts (though I’m pretty sure when they were originally posted they did have worksheets) and I’ll make sure I sort it out! Thank you so much for sharing these wonderful lesson plans. I work full time and also volunteer as an ESL teacher on the weekends and your lessons have been a HUGE help! My learners had an especially great time with the “Try Something New for 30 Days” and “The Science of Smiling” lessons. So fun! Thanks again. I’ll be coming back to this page quite a lot in the forthcoming months – your lessons are incredible. Thanks again! Thanks so much. It’s great to hear about how the materials have been used. I’ll definitely be putting up more materials in the new year. just found the site…I’m going to use the Jamie Oliver lesson tonight and then I’ll let you know what happened but it looks cool, principled and very easy to use, so…Thanks a lot! Hi! Great lesson plans and materials. I’d like to use two of your texts for our Supplementary reading program. We’d have to make the texts available on the institution’s website for our students and the activities to the teachers. Is this ok? Thank you for asking. That should be fine, but I’d like to know which texts please, and to be able to see them on your website. The two texts are ” Pay it forward” and ” The Secret Millionaire”. I’d first need to get the approval from the Curriculum Unit. Approved texts are then made available on the university’s website for students to download and the lesson plans to the teachers. The Secret Millionaire text I wrote myself and I’m happy for you to grade it, but please say where the original came from and that you have adapted it. For the pay it forward, just note that I do not have copyright for the video it is linked to. Alright, rachel. Thanks a lot! I’ll inform you if the texts are approved. Well thought out and the material is great. No busy work and not condescending—these lessons just make wonderful sense. Especially love the “Good Deed” lesson. Thanks so much!! Hi Rachael, I just wanted to say that I think your materials are wonderful. I’m on a DELTA module 2 orientation course at the moment, teaching an intermediate/upper intermediate class and I decided to use your CrowdWish lesson for my second observation (with the source appropriately acknowledged). The students were very interested in the lesson, I loved teaching it and the tutor feedback was very positive. Thanks so much for making and sharing such richly imaginative lesson plans. I just wanted to say thank you for the ‘try something new for 30 days’ video. I showed it to my group of A2s mixed with B1s mixed with even a few A1s (don’t ask! ), knowing that some of them would find it hard to understand. They all found it very interesting, however, and one of the weaker students came in this morning to tell me she’d spent some of her evening on the TED website looking at the German transcripts!!! Thanks very much. It’s great to get some feedback, and I’m really pleased they found it so interesting. Hi, great videos and worksheets! Do you have a link for the “You Got a Dream” lesson plan? Hi Ghislaine. Thanks for spotting this. I have now added the link to the lesson plan. Wonderful! Thank you so much. I really appreciate it. Thank you very much for the great material! It seems like you put a lot of effort into them, they are very detailed and creative! Thank you Rachel This is fantastic!! Many thanks for commenting, and the video link. I don’t have guest bloggers, but I’d be happy to share a link to your site here. I have used the “Living without Money” video and I linked it to this other video about a young woman who lives on a train. Last day I attended your webinar which was much fruitful. Would you please help me understand CEFR; different proficiency levels and how to determine them. Secondly, I want to design English listening and speaking curriculum to cater my national needs. Would you please guide me and help me to reach to my goal. I would highly appreciate if you share your email. Sorry, Saira. Only just seen this comment for some reason. A good site for understanding CEFR is https://www.cambridgeenglishteacher.org/what_is_this as it describes the levels in a clear, relatively jargon free way. Just a quick message to say thank you very much for sharing your inspiring materials. I’ve used the majority of your downloadable lesson plans and my personal favourites are definitely “ Try something new for 30 days “ and “Real Beauty? “ but I enjoyed all the other ones just as much ( and my students did too of course). I think your blog is great and I apologize for not saying thank you before, despite the fact that I’ve been reading it for quite a while now. You also provided me with countless ideas and inspiration when I was struggling with some of my Delta assignments. 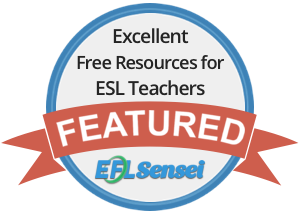 This is a fantastic collection of ready-made lessons, and so generous of you to make them freely available. Wonderful! We run an MA in Applied Linguistics and ELT at Queen Mary (on which I teach a module in multimedia materials development), so I have just recommended your website to my group. Many of the students don’t have teaching experience, and one dissertation option they have is to take the CELTA and write it up. So, having just discovered and purchased a copy of your ‘CELTA Teaching Compendium’ I have also recommended my students buy a copy. Great idea -the CELTA as dissertation I mean, not recommending my book- though that’s also a great idea 😉 Thank you. These look grand, thank you. I can’t help noticing they are for higher levels; I teach one pre-entry class and one class from E3 down to pre entry for the local council, and students join when they arrive in the country. This can mean beginning again or heavy differentiation with some students confused about what we’re doing! When I search for lesson plans (I usually design my own but sometimes time slips away from me) on the internet there are very few for lower levels. Thank you for making these fabulous lesson plans available! !